We are a family owned and operated business with over fifty years of service and nearly two thousand satisfied home owners. Founded in 1964 by Donald M. Lenker, President, our company is proud to celebrate fifty years of service in the housing industry. Gary Lenker serves as Vice President-Director of Operations and Steve Lenker is Vice President- Director of Sales and Marketing. 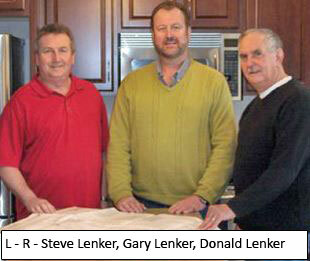 We continue to provide the South Central Pennsylvania area residents with high quality homes. We connect with our customers and provide affordable housing and solutions for both new and experienced home buyers. Although we have a large variety of floor plans available, we are a custom builder whose pricing includes a completely finished home. Our contract guarantees time of completion and prevents hidden or inflated costs to you. The new home you buy is most likely the largest investment you will ever make. Careful consideration in planning of a new home is essential to insure a future of comfort and happiness to you and your family. There are two main things that you will select that will bring your dream home into reality. A home plan that will meet the present and future needs of your family. Donco Construction, Inc. is recognized in the Central Pennsylvania area as a leading builder who is dedicated t to the use of quality materials and fine craftsmanship. Donco Construction, Inc. received the Pennsylvania Builders Association 1992 "Builder of the Year" award. Our experienced and courteous staff will provide the personal attention needed by those buyers who have their own architectural plans and ideas.